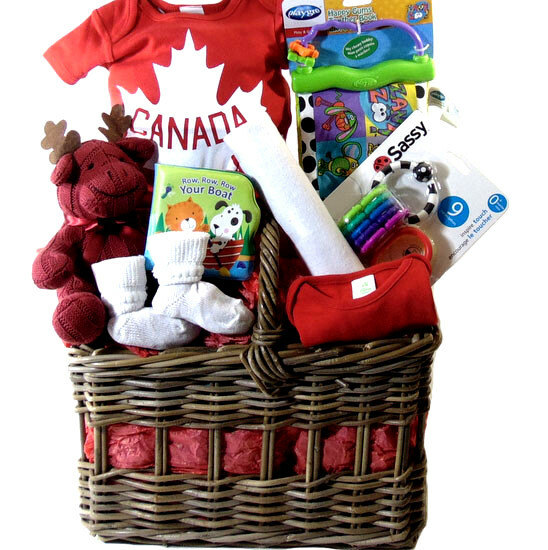 Canada baby gift basket filled with red and white baby products. 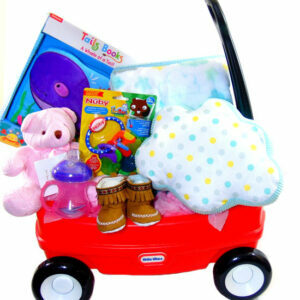 Ideal for newborn baby girl, baby boy and baby shower gift basket. Great baby gift basket for baby born on Canada Day. Brown wicker large basket for storing baby items and toys. Canada flag print on red baby body suit. Red cotton Moose baby stuffed animal. White baby blanket and socks. Baby book, Playgro Teether Book and Sassy baby toy. FREE local hand delivery 7 days a week. All our Baby, Spa and Gourmet gift baskets. GTA, Toronto, Etobicoke, Concord, Scarborough, North York. Pickering, Ajax. Milton, Stouffville, Maple, Brampton, Mississauga.